Your car’s battery is one of the most important parts of your vehicle; it is the driving force as to how your vehicle starts. Having clean, non-corroded battery terminals and cables can make all the difference in how it functions. Can battery corrosion keep a car from starting? If your battery is displaying signs of corrosion, i.e. the gunky white build up surrounding the posts, then yes, it can, in fact, cause your car not to start. The reason being is your battery cables won’t be able to make a significant connection to the terminals to supply power. When you start to notice signs of corrosion, it is best to clean the battery terminals as well as the cables thoroughly. There are some unique, inexpensive tools you can purchase that will make the job go very quickly. If you don’t desire to go out and buy these handy tools you can also use some common household materials to get the job done. How to clean battery terminals with a few tips along the way is very simple. If you choose the method of buying additional tools, there are special wire brushes designed to clean battery terminals as well as sprays that will loosen the corrosion gunk. Let’s get started! First, you are going to want to disconnect both the positive and negative cables from the battery terminals. You can utilize either a socket or wrench to loosen the nuts holding the wires. The next part will vary depending on what method you choose, so we’ll start with the household. Using the baking soda, liberally sprinkle on the terminal and cables. You’ll want to let that sit for a few minutes to start dissolving the corrosion after you will pour water directly on the baking soda that will neutralize the corrosion, and cause a bubbly reaction. It will be now safe to handle. Then you’ll use a wire brush to remove the caked on debris. 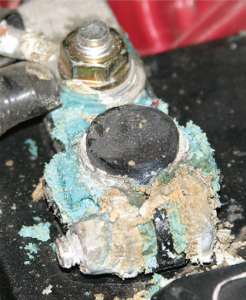 Make sure you are cleaning the battery terminals and the cables, or anywhere you see corrosion build up. After it is clean, you’ll want to use a cloth to clean the surface. 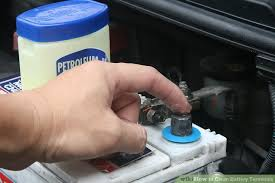 *Tip* If you coat the battery terminals with petroleum jelly, it will still conduct current and help keep corrosion at bay. Then you will just need to reconnect the battery, and you are all done! If you use the store bought tools, you will do the same as above, except using the manufacturer’s instructions on the spray, and the unique wire brush for the terminals. You will want to spin the terminal brush about five times or more depending on how much corrosion is present. Keep your car starting every time, by keeping your battery terminals and cables clean and free of corrosion. It should be done periodically, or anytime you notice a build-up occurring. Previous PostPrevious What Does an Illuminated Engine Light on the Dash Mean?